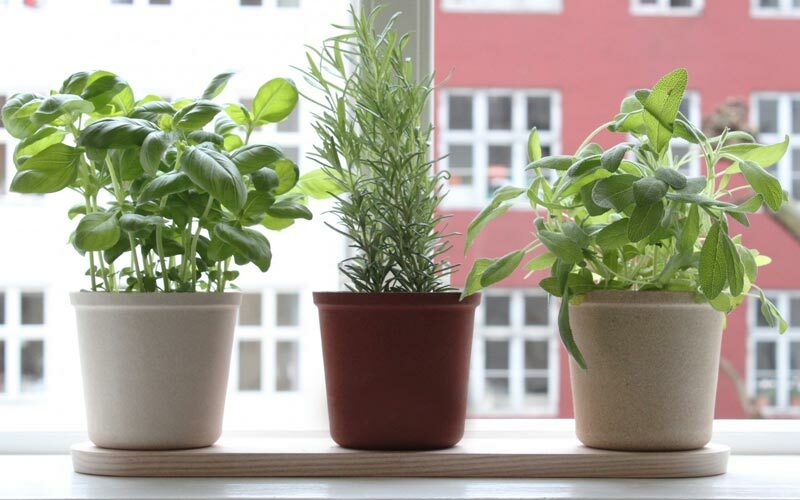 Let your imagination run wild when considering what type of container to grow herbs in. Just about anything will work, but keep in mind, most varieties prefer fast draining soil. As long as the container you select has adequate holes and drains well, you should be in good shape. Another thing to remember, when choosing containers, is that size does matter. The pot must fit the plant – or plants – that will be growing in it. If the container is too small your herbs may quickly become rootbound. On the other hand, if the container is too large, your plants may spend all of their energy on root production and not grow the way they should. When you grow plants in containers, it’s important to provide them with a high quality potting soil or soil-less mix. In other words, you can’t just run out to the backyard, dig up a little dirt, and call it good. Ordinary garden soil is much too heavy and dries out quickly. What you’re looking for is a soil that is loose and well drained. You can purchase a quality potting mix (available at most nurseries and garden supply companies), or you can make your own. A popular mix for container grown plants can be made by combining equal parts of potting soil, peat moss, and perlite (or vermiculite). While most herbs require little fertilizer, you do need to pay closer attention to container grown plants. Because the amount of soil around the plant is limited to the size of the container, it dries out faster and requires more nutrients than the soil in your garden. For herbs, usually all that is needed is a good all-natural organic fertilizer which can be mixed in with the potting mix prior to planting. If your plants loose their color or look a little peeked during the growing season, apply a good liquid fish fertilizer at half the recommended strength every few weeks. Tip: Apply fertilizers sparingly to herbs. Heavy applications will produce large plants, but the essential oils that produce their flavor and aroma will be greatly reduced. If temperatures are warm, a container may require water once or twice a day. Watch closely, and water when the potting mix appears dry and pale, or has shrunk away from the sides of the container. Also, poke your finger in the soil. If it feels moist, it’s all right. If it feels dry, start watering. Keep in mind, that many herbs prefer dry conditions. In most cases, they will not have to be kept as moist, as say, your favorite tomato plant. Unfortunately, this doesn’t apply to all herbs – so make sure you check the watering requirements for individual plants. The essential oils, that give herbs their flavor and aroma, are produced in the largest quantity when they receive plenty of light. For best results, most herb varieties require at least 6 hours of sun per day. If growing indoors, many plants will do fine on a south facing windowsill. If the amount of light is not enough, you can supplement light with fluorescent lamps or a grow light, especially during the winter months. When selecting plants for container gardening, consider the amount of light that is available for a particular spot and read the lighting requirements found on individual seed packets and plant labels. If planting several containers in one area or several plants in a pot, do not mix plants with different lighting requirements. With that said, it is wonderfully easy to provide plants with the light they need when your using containers. If you notice that they are not getting enough sun, just pick them up and move them to a sunnier spot. If they are in too much sun, move them to a shadier location. Shifting container locations is also desirable as the amount of available sunlight changes with the seasons.